Ports at the rear of a Quadra 605, including 8P8C Ethernet expansion. Inside a Quadra 605 case. The Macintosh Quadra 605 (also sold as the Macintosh LC 475 and Macintosh Performa 475) is a personal computer designed, manufactured, and sold by Apple Computer, Inc. from October 1993 to July 1996. The model names reflect a decision made at Apple in 1993 to follow an emerging industry trend of naming product families for their target customers – Quadra for business, LC for education, and Performa for home. Accordingly, the Performa 475 and 476 was sold in department stores and electronics stores such as Circuit City, whereas the Quadra was purchased through an authorized Apple reseller. When introduced, the Quadra 605 was the least expensive new computer in Apple's lineup. (The Performa 410, introduced at the same time, at the same price of about $1,000 USD, which included a monitor, was based on the much older Macintosh LC II with a 16 MHz 68030 processor.) The Quadra 605 reuses the Macintosh LC III's pizza box form factor with minor modifications. The Quadra 605 was discontinued in October 1994, and the LC 475 variant continued to be sold to schools until July 1996. Apple offered no direct replacement for these machines, making it the final Macintosh to use the LC's lightweight slim-line form factor. Apple would not release another desktop computer under 10 pounds (4.5 kg) until the Mac Mini, nearly ten years later. All models come standard with a 68LC040 CPU running at 25 MHz, 4 MB RAM on board, 512 KB of VRAM (expandable to 1 MB), 1 LC III-style Processor Direct Slot, 1 ADB and 2 serial ports, external SCSI port, and a manual-inject floppy drive. Macintosh Performa 475: 4 MB RAM, 160 MB HDD. Bundled with a keyboard and Apple Color Plus 14" Display. Macintosh Performa 476: 4 MB RAM, 230 MB HDD. Bundled with a keyboard and Apple Color Plus 14" Display. Macintosh Quadra 605: 4 MB RAM, 80 MB HDD. Slightly different case design, the only variant that does not have a case screw. Not available in Europe. Macintosh LC 475: 4 MB RAM, 80 MB HDD. Bundled with a keyboard and optionally with an Apple Macintosh Color Display; Education market only. Central processing unit: 25 MHz MC68LC040, 32-bit bus. 8 KB of on-chip L1 cache is divided into 4 KB of data and 4 KB of instruction cache. There are no other caches, although an L2 cache is possible via an LC PDS card. The 68LC040 can be replaced with a 68040 which includes onboard Floating Point Unit. This will approximately triple the speed of floating point operations. Random access memory: 4 MB on the motherboard, one 72-pin SIMM socket for 80 ns or faster SIMMs. The official supported maximum RAM is 36 MB in one 32 MB 72-pin SIMM plus 4 MB on the motherboard, but larger SIMMs do work—up to 128 MB may be used, with some limits on RAM type. Physical limits might apply if the side of the SIMM facing the CPU has thicker chips, as the clips on the SIMM socket will not close around it automatically. It should be possible to manually push the clips enough to hold the SIMM in place. The DJMEMC memory controller used in the Quadra 605's predecessors (Quadra/Centris 610, Quadra/Centris 650 and Quadra 800) will only recognize SIMMs up to 32 MB, while the newer MEMCjr used in the Quadra 605 recognizes the larger sizes. In: Line-level. The input socket is a stereo socket, and can input two channels of a stereo signal—however, these are mixed and only accessible to the hardware as a combined mono 8-bit signal. An Apple PlainTalk Microphone provides line-level input by using a longer 4-contact plug which receives power from a 5 V supply within the input jack. Other microphones only give a mic-level input, and do not work with the Quadra 605. Recording is possible at 11,000 or 22,000 samples/second, with filters applied at 3.5 kHz and 7 kHz, respectively, while recording. Floppy Drive: 1.4 MB SuperDrive, manual-inject. Hard Drive: 80 MB, 160 MB or 230 MB SCSI hard drive, depending on model. Battery: Quadra 605s take a lithium half-AA cell 3.6 V battery. If the battery is drained, the video will not start up. To start up a Quadra 605 with a flat or missing battery, it can be turned on for a few seconds, then turned off for a second then on again. This leaves enough charge in the system's capacitors for video to start up. Power supply: 30 watts standard, but many second-hand machines come with replacement PSUs, either third-party, Apple replacement, or stripped from earlier LC models. Some of these go up to 45 watts. The Quadra 605 is a registered Energy Star-Compliant product. Weight: 8.8 lb / 4 kg standard. A Quadra 605 can support a monitor up to 35 lb / 15.9 kg. Dimensions: 2.9" high x 12.2" wide x 15.3" deep / 7.4 cm high x 31 cm wide x 38.8 cm deep. The Quadra 605 contains one LC III-style 68030-compatible LC Processor Direct Slot. While this is mechanically compatible with previous models' LC PDS (it will take 96-pin or 114-pin LC PDS slot cards) it is not a true LC PDS, but emulates the previous machine's 68030 slot. Due to the success of the LC PDS in earlier Macs and with many expansion options already manufactured, Apple kept the same slot type in these 68040 machines. While the Quadra 605's LC PDS is mostly 68030-compatible, expansion cards made specifically for '030 processors, such as 68881 or 68882 FPUs, will not work. In addition it can utilize the Apple IIe Card, which allows the 605 to emulate an Apple IIe. The Quadra 605 has one SCSI bus, with a 50-pin internal connector (with space for one low-profile 3.5" SCSI device) and one 25-pin DB25F external connector. SCSI is provided by an NCR 53C96 controller, which can achieve 6 MB/s internally with a fast enough drive, or 4 MB/s externally. Two serial ports are provided on a Quadra 605; one 8-pin Mini-DIN printer port and one 9-pin Mini-DIN modem port similar to the printer port, but with an extra pin to supply +5 V power from the ADB power supply. Apple recommends no more than 100 mA should be drawn from this pin. 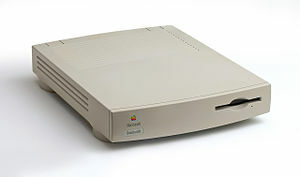 The Quadra 605, like most other Macintoshes manufactured before 1999, includes an Apple Desktop Bus port for use with a keyboard and mouse or other low-speed, low-power peripherals. Some earlier models also contain a ROM SIMM socket, located just to the left of the VRAM. No SIMMs were made for this slot, and most boards only contain the solder pads indicating its position. The ROMs as used in production machines are two surface mount chips located directly behind the CPU. Quadra 605s use a 1024 KB ROM, version 7C. The Quadra 605 was compatible with Apple's Macintosh Processor Upgrade Card which provided a 50 MHz PowerPC 601 CPU. DayStar Digital and Sonnet manufactured 100 MHz versions of this card which could also be used in the Quadra 605. These upgrade cards are fitted in the LC PDS expansion slot, making this slot unavailable for other expansion cards. Some Quadra 605s have a Cuda reset switch which is used to manually reset the PRAM, located towards the rear of the motherboard just to the front of the audio out port and labeled "S1". Others do not include this switch, instead having two solder pads within a silkscreened square. The keyboard power-on key will not start up a Quadra 605 as there is no soft power-on. Only the rocker switch at the back will turn a Quadra 605 on or off. Pressing the power-on key while booted is the same as selecting the Shut Down command in the Finder, and once a Quadra 605 has completed its shutdown process it will prompt the operator to manually turn it off. Quadra 605s have no reset button or programmer's button, but key combinations can perform the same functions. To reset, users can hold down the Command, Control and Power keys. For a programmer's button click, users can hold down the Command and Power keys. There are some hard crash situations where even this is not enough to restore the system, in which case the power switch is the only recourse. A modified Quadra 605 motherboard was used as the basis of early Apple Interactive Television Box prototypes. Later prototypes used their own board design, but still retained a resemblance to the 605. A standard Quadra 605 is capable of running classic Mac OS versions 7.1, 7.1.1 (Pro), 7.5, 7.5.1, 7.5.3, 7.5.5, 7.6, 7.6.1, 8.0, and 8.1. With a PowerPC upgrade installed, it can run 8.5, 8.5.1, 8.6, 9.0, 9.0.1, 9.0.2, 9.0.3, 9.0.4 and 9.1. Versions of the System Software below 7.5 require the use of System Enabler 065. If a Quadra 605 is running a version of System 7.1, over-clocking it from the standard 25 MHz to 33 MHz will change the Gestalt ID, but the enabler will recognize the new ID. Under-clocking to 20 MHz, however, will change the Gestalt ID to one the enabler doesn't recognize as compatible, and the system won't boot. System 7.5 or later is not affected by this issue. ^ Pogue, David; Schorr, Joseph (1999). "Chapter 12: From 128K to Quadra: Mac to Mac". MacWorld Mac Secrets, 5th Edition. IDG Books. pp. 475–476. ISBN 0-7645-4040-8. ^ a b c Sieter, Charles (December 1993). "New 040 Macs - We sort out the complex new lineup". MacWorld Magazine. pp. 92–98. ^ a b "Macintosh LC Series/Quadra 605 - Apple Service Source" (PDF). Apple. ^ "Macintosh Performa 475:Technical Specifications". Apple. ^ "Macintosh Performa 476:Technical Specifications". Apple. ^ a b "Macintosh Quadra 605: Technical Specifications". Apple. ^ "Macintosh LC 475: Technical Specifications". Apple. ^ Lowendmac.com: Mac Benchmarks - Quadra 605 a.k.a. LC 475, Performa 475 or 476. ^ Lowendmac.com: Quadra 605. Quadra 605s work with single-banked SIMMs (Note that single-banked is a logic-level trait, not a physical one; single-banked SIMMs may be single or double sided). ^ Apple.com: VGA Monitors - Which Macintosh Models Are Compatible. ^ Apple.com: Developer Note - Macintosh LC 475 and Macintosh Quadra 605[permanent dead link]. ^ "Macintosh Computers - Low Battery Can Cause No Video". Apple. August 28, 1996. Archived from the original on March 15, 2003. ^ "Energy Star: Registered Apple Products". Apple. April 29, 2002. Archived from the original on June 9, 2002. ^ Apple.com: Desktop Macintosh Computers: How Much Mass (Weight) Can They Support?. ^ Apple.com: LC 475, Performa 475 & 476, Quadra 605 - Expansion Slot. ^ Apple.com: Macintosh LC 475 & Quadra 605 - LC-PDS Q&A. ^ Apple.com: Macintosh - SCSI Data Transfer Rates. ^ Apple.com: LC 475, Quadra 605, Performa 475 476 - Serial Ports. ^ Apple.com: Macintosh - ROM Size for Various Models. ^ Apple.com: Macintosh Computers - ROM Version Numbers. ^ Apple.com: Desktop Macintosh - Power, Reset, and Interrupt Buttons. ^ Apple.com: Macintosh Computers - Gestalt ID Codes. ^ Apple.com: System Enablers - Current Versions & Change History. Wikimedia Commons has media related to Macintosh Quadra 605.